What is a UV light system and will it benefit my family to have one installed? If you or a family member have allergies then an ultraviolet light in your ventilation system would benefit the health of your family. The benefit is that the UV light will effectively kill and prevent the growth of dangerous mold. Mold can be hazardous to the health of you or your family. Mold thrives in the dark, damp areas of your air conditioning and once established can be very expensive to eradicate. Also, in addition to killing the mold, the UV light will also do away with bacteria, viruses and allergens as they pass through your air conditioner. If you or any of your family members suffer from allergies such as those caused by pet dander or pollen, you will notice a marked difference in the quality of the air circulating throughout your home. The bulb needs to be replaced every one or two years. If you take advantage of a Service Plan with Wright Mechanical Services checking the bulb will be part of your yearly check up of your HVAC system. Which UV system should I install in my ventilation? A consultation with a HVAC professional can help you decide if a UV light in your duct work is beneficial for your home. You should not invest in such a system unless you also have a service plan. The bulb needs to be checked once a year and there are safety concerns. There are circumstances when the cost of installing and the maintenance of such a system outweigh the benefits. It is generally accepted that a homeowner should clean their ducts every three to five years. There are a few instances when it is strongly recommended. If you suspect that you have mold in your home it is a good idea to have the ductwork cleaned. Also, if you know that there are rodents or other vermin nesting in the air ducts. It is a time to have them cleaned if you have finished a major remodeling project to get the sawdust or drywall dust cleared out. How do I check if my ducts are leaking? Leaking air ducts will lead to a significant rise in your utility bill. They are easy to fix once the leaks have been identified. The first thing you want to do is turn your HVAC system on so that is blowing air. Once that is done you want to take and run your hand around the duct joints and places where ducts connect and feel for air blowing . Mark these areas with a grease pencil or sharpie. Next, you will want to look for smaller leaks. You will need a smoke pencil or a piece of incense to hold near the duct joints or fittings. If the smoke wavers erratically then mark those areas. Once you have found the leaks in your ventilation system, seal them by wrapping them in foil-faced tape or applying mastic with your hands or a paintbrush. Do NOT use duct tape. The glue will heat up and shrink the tape and it will leak again. 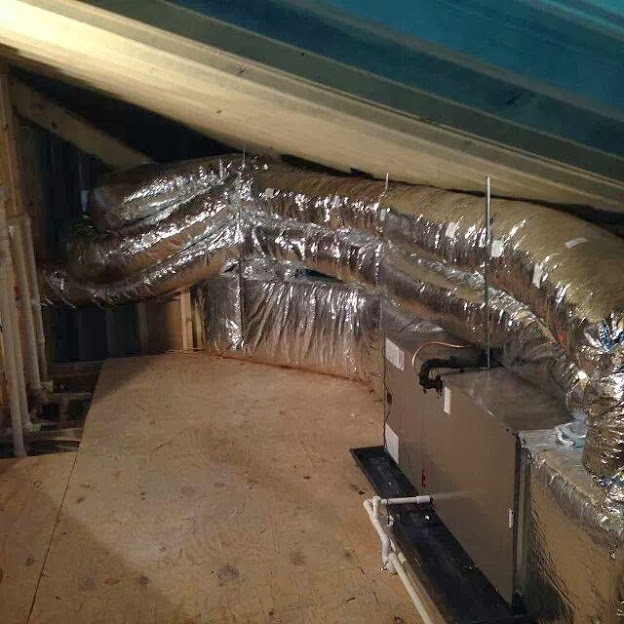 For extra savings you can wrap your duct work in foil-backed fiberglass insulation. If you are serious about finding any other leaks after taking these steps then you can acquire a theatrical fog machine. Close all the vents and blow the fog into the blower and watch for any leaks you may have missed. If you have any questions or you are not sure if you can safely take these steps then you should contact a HVAC specialist. Heat recovery ventilators pull fresh air into a home while simultaneously exhausting stale air from the home. Ideally, the fresh air is delivered to the living room and bedrooms, while stale air is removed from the bathrooms, laundry rooms, and sometimes the kitchen. Both the fresh air stream from outside and the stale air stream from inside the home flow through the HRV. The HRV allows some of the heat from the warmer air stream to be transferred to the cooler air stream. In winter, it recovers some of the heat that would have otherwise been exhausted. This heat transfer occurs without any mixing of the two air streams, reducing the cost of heating. What is the difference between a traditional central ventilation system and a zoned central ventilation system? A traditional central ventilation system has one powerful fan that treats all rooms the same, if the fan is on, it ventilates all rooms at once. A zoned system usually has one centrally located fan, but it allows the homeowner to exhaust only the room(s) in use, such as one bathroom, at a time, so the load placed on the heating and cooling system is significantly less. Zoned systems can add comfort as well as energy efficiency.